Unfortunately I´m not able to show meters and setup of the Focusrite, as this was replaced and sold by the time of writing this post. Now, figures like that is not always the ultimate truth. But in this case it was enough for me to move over to Steinberg. 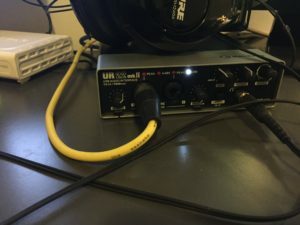 I had experienced severe noise when recording with the Focusrite. Please also take into account that preamp noise is not an issue in all situations. 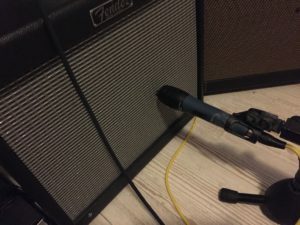 I mainly record clean guitar sounds with a miked amp. Playing loud and/or distorted, or recording direct line-in, you may have a completely different situation. Here is the Steinberg preamp turned up about 60%, me not playing the guitar. 60% input volume on the preamp is the lowest possible setting (in my case) where Reaper doesn´t show anything on the input meter. Here is the Steinberg preamp turned up about 60%, me playing the guitar (strumming a chord). This just barely touch the -18db limit and is enough for a decent recording. Here is the Steinberg preamp turned up about 75%, me not playing the guitar. 75% makes some noise when not playing. An interesting fact in my case is that with the Focusrite i had to be on 75% preamp level to get a decent level recording, but by looking at the input meter bar I would say it was almost double level of noise. And still, probably because of the greater db loss, the recording was barely loud enough. Here strumming a cord at 75% input level. Some like it red and hot but for me this is on a risky level and I consider it too loud. When it comes to noise, Focusrite wont even come close to the Steinberg. The difference is so great that you can not only see it by figures and meters, but also by listening. In my case I was about to completely drop the current setup of miking the amp and go line-in with speaker emulator instead. Now I´m glad I went for the Steinberg. Why is the Steinberg better on noise levels? The Steinberg interface uses Yamaha D-PRE microphone preamps. It seems like this sets a standard on good interface preamps. Why would I still use the Focusrite interface? This post might be seen as warning to stay away from Focusrite – that is not the intention! This is my reflection and it is based on my setup and my needs. The Focusrite is still a very good interface for it´s price, and could be a clear winner in other setups. It comes with some really useful VST plugins, it has stable drivers (not happening at all interface manufacturers), and it´s really easy to use. I recorded my entire second album (Side By Side) with the Focusrite 2i4, line-in, and the Recabinet speaker emulator. Not to be compared to a professional studio recording, but still good enough for releasing a DIY album on Spotify and iTunes.